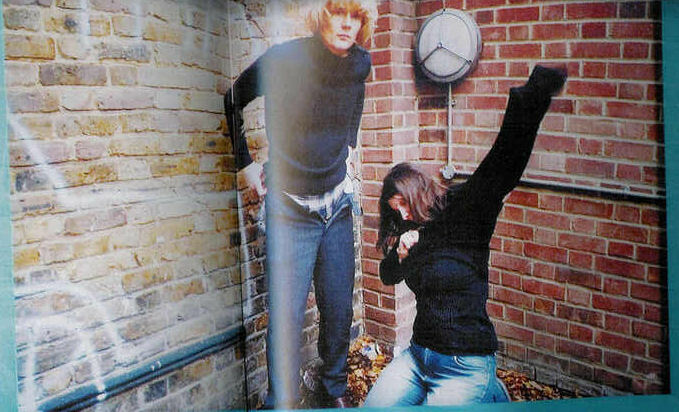 Julian Rhind-Tutt - Within five minutes he had his backside out while his girlfriend snapped away on the camera. I kept thinking of all my friends who would kill to be in my position just then"
So began Liza Frank's quest to be photographed with as many celebrities as possible in the name of art. This hilarious collection of her encounters is the astonishing and sometimes frankly worrying result. With each photograph being entirely directed by the Boyfriend in question, she found herself posing on motorbikes, running away from deer, sharing sausages, sipping margaritas in a very pink hotel room, having a gun held to her head in a bizarre cult suicide pact, and even being proposed to. Guaranteed to appeal to anyone who 'reads' celebrity magazines, gets trigger happy at the sight of what's-his-name off the telly, or dreams of having a Celebrity Boyfriend of their own one day, "My Celebrity Boyfriend" is a daring, unruly and altogether surprising look-through-a-lens at the nation's favourite celebrities. 'It's a hot sunny May morning and your 6' 2" Scandinavian girlfriend/boyfriend has suggested you spend the rest of the day in bed. Should you lie back and think of England in its unparalleled period of post-war stability and prosperity ... or, as I have had to do at countless local and national elections, say: "No, please excuse me, Eva, I must rush down to my local primary school where a selection of eccentric, rosetted sociopaths are waiting to beckon me into a cardboard cubicle, where I must mark a small piece of photocopied paper with an X, in order to reduce an unstoppable 11,000 vote majority to 10,999."? Who knows, it may irrevocably affect the colour of my recycling bags. It's a tricky one. The dominant Channel 4 news story of the last two years has been a war ... ostensibly to secure the fundamental human right of a country to determine its own future. There are many compelling arguments about the unjustness or illegality of the war and how it was conducted. But I'm concerned here only with the larger aspiration of helping others to achieve freedom and equality, to eschew repression. This is a worthwhile struggle. Oddly, this struggle is rendered almost completely worthless if you can't be bothered to tear yourself away from Eva for an hour and stroll down to your local primary school. It all seems a long way from changing the world or defending democracy. But when apathy steals in on a sunny afternoon, corruption and decay will surely follow. I remember Eva once saying to me as she padded out to my roof terrace, the silk sheet dropping behind her, and lowered her legs for what seemed like an eternity into the warmth of the jacuzzi: "It's only through the strengthening of our own democracy that we can go on to defend the human rights of others"
Actor Julian Rhind-Tutt, soon to appear in a new comedy-drama series on Channel 4, Green Wing, says he likes his hair long "because it covers up my big ears and hides a multitude of sins. There is a more relaxed culture now, so long hair makes less of a statement. It's not an issue until you walk into an environment where short hair is de rigueur and then you can feel out of place." IT WAS intended as a stark introduction to the brutality and misery of World War One - 16 hours in the mud with only meagre army rations. But some of the actors preparing for their roles in Somme, a film based on the infamous battle, found digging and sandbagging their own trench then sleeping in it overnight enough to prompt a mutiny. The rebellion against William Boyd, the film's writer-director, was led by Julian Rhind-Tutt, a former Royal National Theatre actor, who plays an officer. Rhind-Tutt did not cover himself in military glory when the biting cold and limited menu proved unpalatable. However, he remained in character and penned a note to his colleagues. "By the time you read this, I will be back in dear old Blighty," he wrote - adding his mobile phone number. Then he marched off in full uniform to an automatic teller machine and took a taxi to his London home.